The ability to change a negative into a positive, to turn lemons into lemonade, and to then share that recipe with the world to prevent others from suffering—it’s one of the most beautiful things a person can do. These stories and storytellers in Lemonade Stand are full of heart and are the definition of courage. Inside you’ll find a transforming look at a young woman who was assaulted by her best friend, a father navigating raising newborn triplets, and a man who lost his eyesight in a tragic accident and proved that you don’t need eyes to truly see. 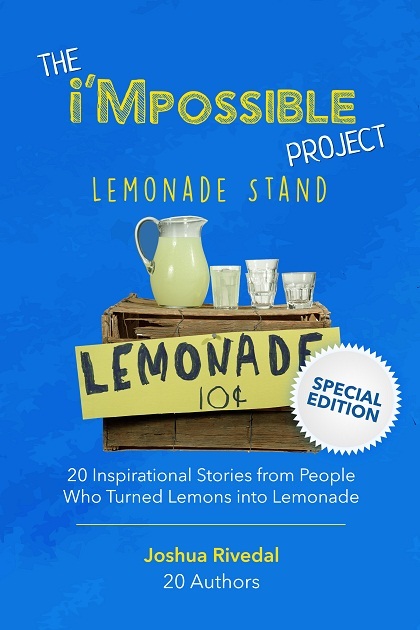 When life gives you lemons, squeeze, add sugar and pick up a copy of The i’Mpossible Project’s Lemonade Stand. In 2015 and in 2017, The i’Mpossible Project released two volumes of 50 true, short stories: Reengaging with Life, Creating a New You; and Changing Minds, Breaking Stigma, Achieving the Impossible. The former included a diversity of stories and topics, while the latter was all on mental health and mental illness. And while collecting stories from these “lemonade-meisters,” I discovered twenty authors who didn’t fit into our two editions (nor our upcoming third and fourth volumes) but whose voices needed to be heard. And so, Lemonade Stand was born (cue “The Circle of Life” music from The Lion King … “Nants ingonyama bagithi” is the legal amount of lyrics I can use from that song without paying royalties.). This is a limited special edition of i’Mpossible only available in ebook (for now) that will change lives, warm hearts, and refresh the soul. These twenty authors all have a powerful and incredible message—stories I couldn’t put down or get out of my head. It is my hope that after reading through our Lemonade Stand, that you leave feeling empowered and ready to start creating new recipes to make your own lemonade.